Any type of sharpening stone, no matter what material, is intended to abrade or cut the metal you are sharpening. Depending upon the type of stone you choose, you can get very different results. The coarser the stone, the faster it cuts. However, coarse stones leave a very dull edge. Finer stones are used to produce sharper edges. However, the finest stones cut slower. How are the different grits used? A coarser stone is used when more metal needs to be removed, such as in a nicked or a very dull blade. These coarse stones cut much faster than a medium or fine stone. I have seen beginners try to skip the coarse stone thinking that they can just work on the finer stone longer to save time. Unfortunately, this technique leads to frustration. A coarse stone is an absolute necessity to have on hand because it saves time and sets the foundation for sharpening your edge. The medium stones are used after the coarse stone and before the fine stone. While skipping this step is tempting, it will cost you a lot of time and wear on your fine stone. The coarse stone leaves a scratched edge. Trying to smooth out the coarse edge with a stone that is too fine will waste time and wear out the finer stone. The medium stone will make the transition from the coarse stone to the fine stone quick transition. The finest stones are used last to produce the sharpest edge. There are many different levels of fine stones. Any of the stones we carry that are marked fine will produce a good edge for most jobs. However, if you really appreciate an extremely fine edge, the stones labeled extra fine or finer will produce an edge as sharp as or sharper than a razor’s edge. Learn how the different sharpening stone materials compare. 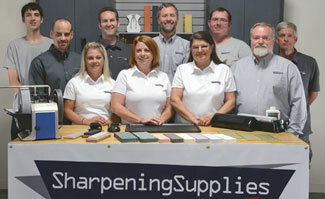 Or view all our sharpening stones. Questions about which stone to use when?